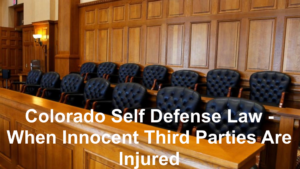 Colorado Self Defense Law – When Innocent Third Parties Are Injured – There are times when a person has lawfully acted in self defense and unfortunately, innocent bystanders are harmed. When this happens the law may act to extend the affirmative defense of self defense to those third parties. This article explores that issue. Under Colorado law it is an affirmative defense for a Defendant to use physical force upon another person . . . to defend himself or a third person from what he reasonably believed to be the use of unlawful physical force, and … he uses a degree of force which he reasonably believed to be necessary for that purpose. But what about innocent third parties who are not directly involved in the incident? The scenario is clear. What we are analyzing is the situation where an accused exercises what I will call “perfect” self defense in a criminal case. This is a case where the person is charged – (usually) – with a crime involving violence legally uses his right to defend himself against the aggression of another. However, instead of, or in addition to, defending himself against the aggressor, he injures one or more innocent bystanders. Although a Defendant acting in self-defense against one person might not be liable for an unintentional injury to another person, the result is otherwise if under all the circumstances, including the need to defend oneself, the Defendant was reckless with regard to the bystander. The essential nature of asserting a claim of self -defense in Colorado treats as justified the use of reasonable, proportionate and necessary force in response to an imminent threat of unlawful force. 2….. that the use of such force is necessary to avoid this danger. The nature of self-defense then is the legal justification for the use of force. Unlike other states (see Pennsylvania below), the law in Colorado as to possible harm that may be sustained by an innocent bystander does not provide an absolute rule that a Defendant who has a perfect claim of self defense against one person would never liable for unintentional injury to a bystander. Rather the law in Colorado in this area is analogous and reflective of Section 3.09 of the Model Penal Code. Section 3.09 of the Model Penal Code provides that a person who acts is justified in using self-defense but does so recklessly or negligently and injures an innocent person, may be found criminally liable. The Model Penal Code provides that the actor exercising self defense conduct himself in a prudent and reasonable manner when using force in that exercise of justifiable self-defense. However, unlike the Model Penal Code, Colorado removes the alternative mental state of negligence and requires the higher mental state of recklessness before holding the Defendant criminally liable for injuries to innocent bystanders. In Colorado, if a person acts recklessly (not negligently as in the Model Penal Code) in exercising his right of self-defense, he may be held criminally liable for injuries suffered by a bystander. A Trial Court must make certain that a jury considering self defense where there have been injuries to innocent bystanders, must understand that whether or not a Defendant acted as a reasonable person would have acted under similar circumstances. Stated again, under Colorado Law a person who acts recklessly in exercising his right to self-defense may be held criminally liable for injuries inflicted on an innocent bystander. Even if a Defendant is justified in defending himself against his attacker, the issue of whether or not he acted recklessly towards an innocent bystande, is a question of fact that must go to the jury. A successful claim of self-defense does not automatically negate the element of recklessness with respect to persons other than the attacker. Courts across the country are not in agreement on this issue. The majority of courts take the position as does Colorado and will allow a self-defense justification for the use of violence to “transfer” (similar to the donctrine of transferred intent), to innocent bystanders freeing a Defendant from criminal liability but this doctrine of transferred justification requires that the . Defendant act reasonably and not recklessly and with proper care to avoid harming bystanders. In what may be the seminal case in this area, Commonwealth vs. Fowlin, 551 Pa. 414, 420 – 421 710 A.2d 1130, 1133-1134 (1998), the Supreme Court of Pennsylvania held that a person who unintentionally injures a third party bystander while using justifiable force in self-defense may not be criminally liable for his injury to the bystander. Fowlin involved a shooting in a crowded nightclub. On December 12, 1993, Fowlin was present in a crowded nightclub in Easton, Pennsylvania armed with a handgun. Three men, (two of whom were also armed with handguns) attacked Fowlin. One of the three sprayed pepper gas in his eyes during which time another man drew a handgun. Fowlin believed he was about to be killed, and blinded by pepper spray, he drew his handgun and fired repeatedly in the direction of the attackers. He killed the assailant who had drawn the gun and wounded one of the others. He also wounded a bystander. The Pennsylvania Supreme Court held that one may never be held criminally liable for the unintentional injury to third parties while using justifiable force in self defense. “… the law of Pennsylvania does not require one to stand by helplessly while he is injured or killed by an assailant. And as [a lower court Judge] aptly points out, when one is the victim of an attack, the assailant, not the victim, picks the time, the place, the manner, and the circumstances of the attack. “Any victim of crime who justifiably exercises his right of self-preservation may inadvertently injure a bystander. Admittedly, this court could fashion a rule of law which holds the defender criminally liable, but in doing so, we would have furthered no policy of the criminal law. While the Trial Court held that in order to avoid criminal liability, a person defending himself must not only be properly engaged in defending himself, he must not act recklessly. Colorado uses the same test. But Fowlin stands for the proposition that the proper use of self defense is a complete bar to prosecution for injuries to innocent bystanders. There are states, such as the State of Virginia, that have “codified” – (placed into statute form) – the law of transferred intent – or “transferred justification” for the use of force in an exercise of self defense involving innocent third parties. If you believe that the defendant was acting in self-defense as to the actions of (name of person defended against) at the time he [killed; wounded] (name of victim) accidentally, then you shall find him not guilty. The law of self defense is a complex area even for the most practiced Colorado criminal defense lawyer, When innocent third parties are injured in the legally justifiable act of self defense the situation becomes even more complex under the law as it presently exists in Colorado. The well understood doctrine of transferred intent should be logically extended to a doctrine referred to as transferred justification where a perfect act of self defense harms innocent third parties. If you found any of the information I have provided on this web page article helpful please click my Plus+1 or the Share buttons for Twitter and Facebook below so that others may also find it. The contents of this article are based upon my research, my personal experience and my personal analysis and opinions developed from my thirty six years (as of 2018) of criminal trial experience from both sides of the courtroom – as a former career prosecutor for Arapahoe and Douglas Counties (13 years) and as the owner of my own Criminal Defense Law Firm since 1999 (19 years). The reader is also admonished that Colorado criminal law, like criminal law in every state and at the Federal level, changes constantly. The article appearing above was accurate at the time it was drafted but it cannot account for changes occurring after it was uploaded. If, after reading this article, you have questions about your case and would like to consider retaining our law firm, we invite you to contact us at the Steinberg Colorado Criminal Defense Law Firm – 303-627-7777. A Denver Colorado Criminal Defense Lawyer – or call his office at 303-627-7777 during business hours – or call his cell if you cannot wait and need his immediate assistance – please call 720-220-2277. You should be careful to make a responsible choice in selecting a Colorado Criminal Defense Lawyer. We encourage you to “vet” our firm. Over the last 36 plus years – by focusing ONLY on Colorado criminal law – H. Michael has had the necessary time to commit to the task of constantly updating himself on nearly every area of criminal law, to include Colorado criminal law and procedure and trial and courtroom practice. 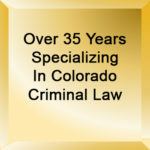 Putting more than 36 years of Colorado criminal defense experience to work for you. H. Michael works hard to get his clients the best possible results in and out of the courtroom. 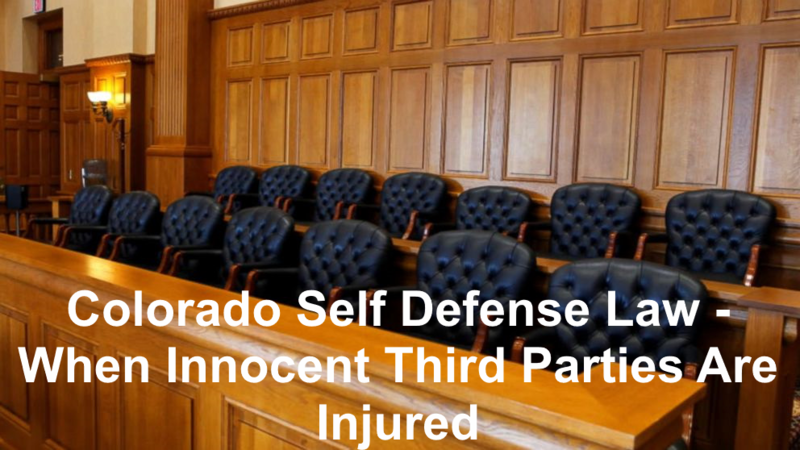 He has written, and continues to write, extensively on Colorado criminal law and he hopes this article helps you in some small way – Colorado Self Defense Law – When Innocent Third Parties Are Injured. There are times when a person has lawfully acted in self defense and unfortunately, innocent bystanders are harmed. When this happens the law may act to extend the affirmative defense of self defense to those third parties. This article explores that issue.